Am I mistaken or is it actually winter? Because you wouldn’t know it judging from websites of solar companies. Seems like it’s summer 365 days of the year, and that’s a serious disconnect and a lost solar marketing opportunity. I discovered this simple yet important solar marketing oversight because I’ve just returned from Solar Canada 2014, and an installer told me he had to get on the phone to find out any information about solar panel durability during the extreme colds of Northern Ontario, eh? I thought that extra effort was odd, so I checked some leading solar company websites, and he was right. Not only is it hard to find information about solar products or installation and O&M in winter, but solar marketers also seem to completely ignore the entire season. In fact, my bet is that most solar websites in every sector act as if every season is summer, and isn’t that unreal? Let’s be clear. For “winter,” I’m not talking about holiday messaging and images—although that’s important, too. I’m really just talking about images and information that inform customers about how well your solar panels, inverters, racking, BOS, and installations work in the snow, ice, cold, wind, driving rain, hail, etc. 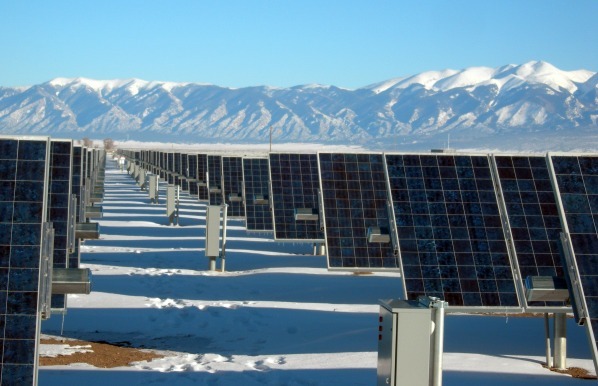 How does your solar product or install service stand up to Jack Frost? How should these solar products and installations be maintained during those months? Is there any preventative maintenance that can be done? If nothing needs to be done, what has your solar company done, tested, or experienced to ensure potential customers that nothing will need to be done? Do you have any examples/case studies of your products or installations in nipping-at-your nose conditions, especially photos or videos? Yes, solar sales and install numbers go down during the winter months, but that doesn’t mean installers and consumers in “JHC!-it’s-cold” climates don’t want to know how your miraculous solar products and systems will perform when the weather outside is frightful for the 12-days of Christmas and other Bah-Humbug short solar days and long nights. Solar pros may know that silicon-based solar panels are more efficient during the winter months and that you should let the snow and ice melt rather than scrape them off panels, but consumers don’t. As for installers, they’re more concerned about your rigorous testing and case studies about product performance during below-0 temps, hail, ice, and snow. The same goes for inverters, racking, pole mounts, trackers, and other key BOS components. I’m surprised by this industry-wide oversight because it’s not like manufacturers don’t have this information. I know and have seen testing facilities for various certifications, so the problem is that you’re hiding this information during its most relevant time of the year, and that’s a mistake from a customer service perspective, as well as from a marketing perspective. Why? Because lots of people complain that solar products are commodities, and yet here’s a beautiful way for you to show how your panels and other solar widgets are the best choice for cold climates. And if you’re an installer, you could tell stories about how you’ve carefully selected these products through your years of cold-weather experience, and ho-h-ho, you’ve got the frost-bite to prove it! The good news is that it’s not too late to deck your website home page with boughs of winter photographs with links to more temperature performance information. That’s the beauty of websites. Unlike the North Pole, they’re not frozen. You can change them every three months and reflect every season, not just an everlasting photo-stream of summer. Not only is that boring, it’s also unreal, even for desert climates that can have an extreme range of temperatures between 3am and 3pm. So, a lump of coal in your solar marketing stockings for you if you don’t give customers easy access to information about your solar product’s performance during the changing seasons, especially winter. Doing so is just one merry way… to UnThink Solar. Thank you Solar Fred for writing about this topic. Being apart of a solar company in North Western Ontario, being winter prepared is a big component of our system education. We do many off grid projects in the spring, summer and fall, but making sure that the systems last through the harsh winters is critical. No one likes coming to their cottage in the spring to frozen batteries or damaged equipment!